* Locus Recommended ReadingHere are 33 weird, wonderful stories concerning men, women, teleportation, wind-up cats, and brown paper bags. By turns whimsical and unsettling—frequently managing to be both—these short fictions describe family relationships, bad breakups, and travel to outer space. Vukcevich's loopy, fun-house mirror take on everyday life belongs to the same absurdist school of work as that of George Saunders, David Sedaris, Ken Kalfus, and Victor Pelevin, although there is no one quite like him. Try one of these stories, it won't take you long, but it will turn your head inside out. "What other writer could make you start laughing halfway down the first page of a story about a man putting on a sweater? Thurber maybe, a long time ago. Buy this book." —Damon Knight"These stories cannot be compared to anyone else's. There is no one in the same class as Ray Vukcevich. The stories are uniquely, splendidly, brilliantly original, a surprise in each and every one, and brimming with wit and laugh-out-loud humor. A stunning collection." —Kate Wilhelm"The absurd and the profound are seamlessly joined through fine writing. 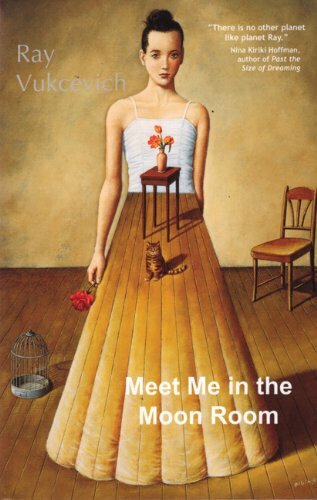 Meet Me in the Moon Room is a first-rate collection. —Jeffrey Ford"The 33 brief stories in Meet Me in the Moon Room defy categorization genre. A few toy with the conventions of science fiction; others branch off from trails blazed by Donald Barthelme. Moon Room will delight those who appreciated the risks Don DeLillo took in Ratner's Star." —Hartford Courant"Eccentric short stories, which frequently give everyday life a loopy twist." —Book Magazine"Ray Vukcevich is a master of the last line. Almost every one of his stories has a zinger at the end, but not the kind of zinger that chocks the reader or causes annoyance. Often it's a perfect line of dialogue that opens up the whole story.... Vukcevich is ingenious with the short-story form. Although the stories read as playful vignettes, Vukcevich covertly works in ideas of self, identity, destiny, and obsession. And occasionally, the dangers of outer space." —Review of Contemporary Fiction"Vukcevich is a master of radical recombinations, drawing from (amongst others) the Brothers Grimm, Dickens, Lewis Carroll, Kafka, O. Henry, Dali, Asimov, pulpish space opera, and the latest in nanotech to produce works that are all his own. Sometimes in as little as four or five pages, he deftly juggles so many ideas, emotions, and perspectives, it produces a curiously refreshing sense of vertigo—a high with no hangover to follow.... It would be...a great mistake to ignore the extraordinary talent of Ray Vukcevich." —Locus"Vukcevich is a very slick writer, an authentic sprinter in an era of milers and all-out stayers.... Vukcevich can do punchlines, but he does not rely on them. Indeed, his extraordinarily light touch when it comes to narrative closure is his most distinctive feature. Anyone who considers bizarre surrealism and casual absurdity—the main stocks-in-trade of the fantastic ultrashort story writer—easy clay to mold into narrative form has not given serious consideration to the matter of finishing." —New York Review of Science Fiction"These stories niftily propel their characters down the blurred line between fantasy and psychosis, with effects spanning the gamut from melancholy to goofy, from plaintive to outraged.... This is Vukcevich's gloriously mad world, and we are lucky to share it."